Jake Paltrow isn’t exactly what you’d call the most prolific director, having not helmed anything since 2007’s middling dream lover comedy The Good Night, which starred older sister Gwyneth. His sophomore effort, at least on paper, sounds exactly like a sophomore effort, but a bunch of big names just came raining down on the project. The water reference will make sense in a minute. Variety reports that Michael Shannon, Nicholas Hoult, Elle Fanning and Kodi Smit-McPhee have all signed up for Paltrow’s sci-fi thriller Young Ones, adding quite a bit of legitimacy to the film. Hoult has made his splash from one side of the pond to the next, with Warm Bodies performing better than expected. Shannon has been damned near perfect in everything he stars in, more recently in Boardwalk Empire and Premium Rush. The younger Fanning sister has already shown deft maturity as an actress in The Curious Case of Benjamin Button and Super 8. And Smit-McPhee’s highly dramatic roles in Let Me In and The Road will probably help him for Young Ones, as it appears he will be the central character to film’s story. The film will take place in a future where humanity has violently turned on itself due to water quickly becoming one of the most limited resources on the planet (Water reference! ), and will focus on a 14-year-old boy named Jake who must use his wits to survive. Will Michael Shannon also play General Zod in this film? It might take a while to find out. To give you a clue as to how long Young Ones has been in development, Elle Fanning was attached to the project almost two full years ago, when Casey Affleck and Jamie Bell were also set to star, and Noah Baumbach was going to produce. It’s always good to end things on a hopeful note. 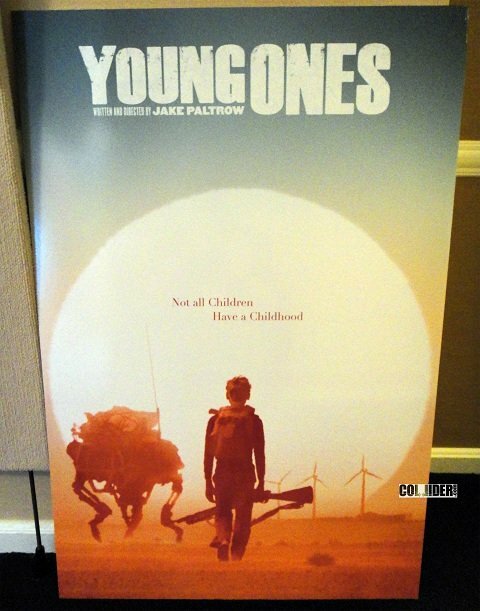 Young Ones producer Michael Auret of Spier Films says “Jake's engaging tale of hope and courage in a neo-realistic dystopia will have universal appeal.” When someone uses a word like neo-realistic, you know you’ve got a winner on your hands. Below is the promotional poster used for the film back in 2011, courtesy of Collider.